When mold is discovered in a property you are renting, it is important that you determine the full extent of the problem so it can be remedied properly by your landlord. Minor surface mold on a non-porous surface, such as the tile in a shower, is not always severe enough to alert your landlord. However, if mold is growing under a sink, on a wall, or in another areas where more than a square foot of building material contains connected or unconnected colonies of mold, you should take action. Beyond visual mold growth, if there is a strong musty odor that lingers or returns after airing out your property or if someone is experiencing adverse health symptoms after being in the property for any period of time, you should reach out to your landlord or property maintenance person immediately. If the situation seems serious enough, and you feel that conditions are or could pose a health risk to yourself or others at your property, it is important that the landlord responds and attempts to remedy the situation. A proper response to a potential mold contamination at a property is to get a professional inspection conducted with mold testing of the air and surfaces where visual growth is present. Doing this will scientifically determine if a problem exists and the full extent of the problem. An inspection will essentially tell you if your property is a health risk or not. It is important to note that some remedies pursued by landlords cut corners, potentially endangering the lives of those at your property. These can include painting over the mold on the surface, wiping the surface down with bleach, airing out the interior or fixing the source of the moisture that caused the mold growth (such as a leaky pipe). While these matters may seem to solve the problem, it only covers the surface of the problem and not the root. These temporary fixes almost always lead to a return of the problem, if they did anything to help. Important Note: Regular bleach does not completely kill mold in many cases. In addition, “cleaning” mold off of a surface where deep mold growth has occurred will not remedy the situation and can often lead to an even worse situation when the mold surfaces again. This because if the mold can’t grow outward to a visual location, it will often grow deeper into hidden areas. Following an inspection, if it is determined that a problem exists, only professional mold remediation should be performed to ensure that the problem is completely eliminated and to prevent other parts of your property or your belongings from being impacted by cross-contamination. If your landlord isn’t responding to your request for action or tried to cover up the problem and you are still concerned or are continuing to experience health problems from mold, you need to follow certain steps to document your actions and observations. Step 1: Keep a log of everything you have noticed about the problem and the date and time of when those things were noticed. This includes visual sightings of mold, musty smells, sicknesses experienced by those who share the property with you, etc. Also, keep note of any attempts to contact your landlord and any responses, including coming out to try and fix the problem. Any details throughout all of these steps should be well documented from your perspective, along with the perspective of other “witnesses” involved. Step 2: If your initial phone call or otherwise to your landlord did not produce any results, write a letter and send it via United States Postal Service certified mail to your landlord. Make photocopies of everything your send before sending it. Even if your landlord is down the hall, do this so there is a record with the postal service of your attempt to make contact. Wait to see if they respond. 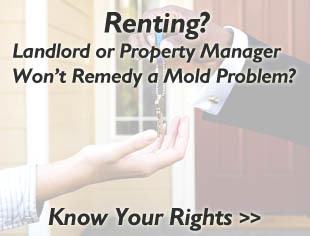 Step 3: If your landlord does not respond or respond in a proper way, it is recommended that you seek the advice of a mold attorney to further understand your rights and if legal action is necessary to encourage a course of action that remedies the problem, helps escape your lease to find a healthier environment, or to seek restitution for losses you or those at your property have experienced from exposure to mold. Click here to find a mold attorney in your state. Step 4 (in some states): If you have taken steps to contact your landlord without resolve, you may also have the option to have a mold inspection conducted where you pay for the inspection, but deduct the full cost from your next rental payment. This is similar to the “repair and deduct” codes that exist in the renter’s rights laws in various states. Research your state’s warranty of habitability and tenant’s rights laws to find out if this is an option. 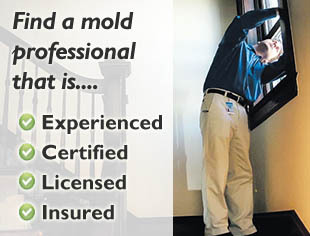 Finding an Inspector: If you have decided that you would like to seek out a mold company to conduct an inspection to determine if you have a problem, find a certified company in your area here. Why is reacting to mold the best course of action? It keeps a property clean and healthy. Early detection of a potential problem area is key to keeping the remediation cost lower. A more serious leak or other issue could be the cause. Mold and water damage bring down the property value significantly. It’s nearly always a fixable issue through proper fungal remediation of the areas affected. Reputable companies offer a warranty to ensure their remediation work so it doesn’t return. Reputable companies provide post-remediation clearance testing to ensure that the environment is clean and healthy.